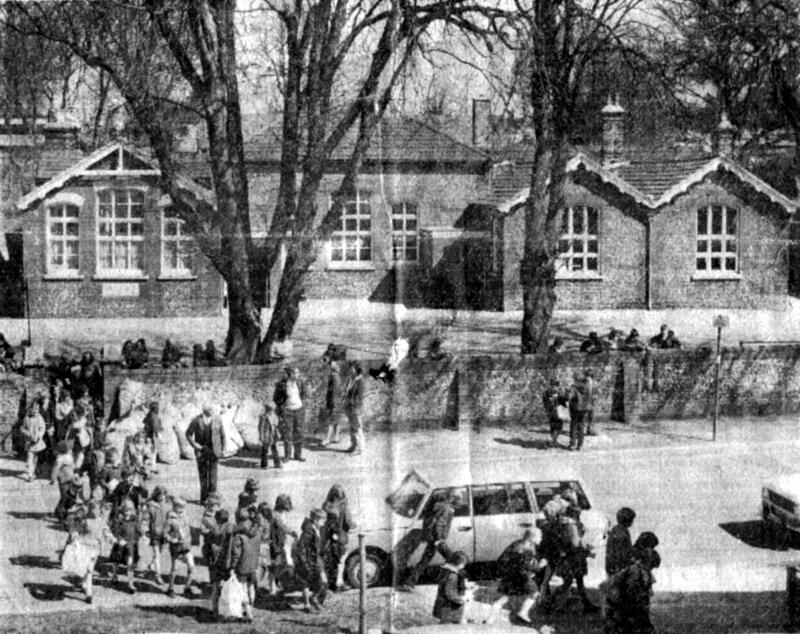 “My first teaching post, back in 1968, was in New Alresford Junior School, in The Dean – half way down the road on the right, just after the caravan park. It was an old, 1887-built, flint and brick building, with a tarmac playground at the front of the school, and two huge beech trees, with a small grass area at the rear which also housed two huts, the outside toilets and the caretaker’s store and coal room. Just before I arrived, the infants’ classes had moved out, and were established in a brand new school building on Sun Hill Lane. I arrived in 1968, and stayed for four years, joining – among others – the headmaster Ron Longley, deputy head Arthur Hodkin, and teachers Lionel Ginsburg, Grace Strong and Cathy Phillips. My feeling is that a lot of time was spent preparing the children for the eleven plus, and a strong “them and us” feeling was present – that may just have been my view though. My memory says that during the first year there, I caught the train from Winchester to Alresford every day, but after the railway closed, I then used the bus, going along the old Winchester road. The building was well past its sell-by date even in the 1960s. In the winter the boys’ toilets froze up (they were in an outside building) and this produced no end of inventive solutions, which included the use of buckets of hot water etc. My classroom was in the main building, and was a long high-ceilinged room with windows way above our heads. The children sat at old beech desks, in front of the teacher’s high desk: there was a coal burner stove with a rail around, and this always smelt of sour milk. This came from the children’s one third of a pint milk bottles, which were lined up around the fire to warm them up, for those children who liked it that way: these were then issued by the milk monitors at morning break. Several times each winter, especially in October/November, we had a minor flood when it rained – from a little outside passage surrounded by walls, where the drain regularly blocked up with fallen leaves. My job would be to take a long stick and poke away at the drain cover until the water ran away freely. At the back of the main building, and on the rising ground, were the huts – and a small field of grass, which was used for breaks and lunch-breaks. There we buried my first class “pet” – a guinea-pig which somehow escaped from its cage one night and stuffed itself into its jar of food, where it ate itself to death. For months after the small grave was marked by little crosses that the children made from lollipop sticks and shiny sweet wrappers. Games and sports were held in a field that seemed to be half way across the town – the trek there reduced the time we had for sports by half every afternoon! But, during the summer term we were able to take nature walks along the river path – going not quite as far as the eel-house in one direction or the swimming pool in the other, but it was always a pleasure to go past the beautiful Fulling Mill, set straddling the main river flow. Many of the children attending The Dean came from smaller villages such as Old Alresford, Kilmeston, Beauworth, Bishop’s Sutton – so were always a wide mix of experiences and local farming backgrounds – including at least one lad whose main diet seemed to consist of whatever was in season on the farm where his Dad worked. Several of the children had special traditional skills and commitments – every year in July several of the older boys disappeared for what seemed like a long weekend, which coincided with the Alresford Sheep Fair – my guess is they were earning a few shillings helping out. Chris Pines went on to teach at the Winnall Primary in Winchester, where he says he spent many happy years: he also became a local City Councillor, and then eventually a Mayor of Winchester (apparently number 808!). Chris still lives in St Cross. From Chris’s comments, one of the fascinating aspects of teaching in one area over many years, appears to be seeing how the children grow up and develop in later years, and then even teaching their children! One young lady he taught at the Dean School in Alresford, Carol, had three children who went through his classes in Winnall: similarly a young man, Clive, from the Dean School in Alresford, later became a City Councillor in Winchester, and sent his own four children to Chris’s school in Winnall. Some of Chris’s students have developed along previously unexpected lines – one runs an Art Shop, and another developed to be a well-known film star! I do remember the school toilets, oh so well! They stood on their own in the small yard at the rear of the old school building. If you needed the toilet during school time you had to face the humiliation of putting your hand up in front of the whole class, to request a toilet visit and then face the further humiliation, as the teacher would issue you with the regulation ‘three sheets of toilet paper’. I also remember one playtime when it was raining heavily and water was gushing down from a broken drain pipe in the boys’ urinal, and my friend Roger and myself were stood under the full force of the water, getting absolutely soaked. When we were caught by one of the dinner ladies, Mrs Cox, we were instantly sent to the headmistress’s office, to be punished: which meant to receive the cane. We hadn’t expected that, as Mrs Cox was actually Roger’s mother! Your Editor moved to Alresford in 1981, and my son, also called Nick Denbow, went to the Sun Hill Infants School, when Mr Longley was Headmaster there: he enjoyed being taught by Grace Strong, who Chris Pines says has now retired. If anyone else has memories of the Dean or Sun Hill Schools they want to add here, please send them in, either via the NATT website, or direct to nick@nickdenbow.com. The School House is described as a plain, strong building standing at the bottom of West Street. But the actual school room, and some of the accommodation for the pupils, was at numbers 56 and 58 West Street. These two current buildings at that time were joined together to provide one large and very lofty school-room, adjoining the School master’s house. This school continued in operation until 1932, when the school moved to the current site at the top of Pound Hill. In 1971 the corner building was recorded as being Mr Howarth’s cafe, in a town survey conducted by Sun Hill Junior School students. In 1985 it was the home of the chef-proprietors of the Old School House Restaurant, the catering business run there by Terry and Sara McTurk. In 2013 it is now an Indian restaurant, known as the Shapla. The shops created out of the school room have had many uses. Number 56, now Oakleaf Stationers, in 1971 was Wilstead’s, a chemist in a 1971 Sun Hill Junior School Survey: this then became Mr Goode, the chemist, in a 1985 survey. Next door at 58 there was a newsagents known as Perins in 1971, and was still a newsagent in 1985: in 2013 this is a hairdresser. Diagonally across the cross roads outside the Old School House, and next to the Fire Station, is the house known as St Joan’s. Many years ago St Joan’s was a convent, and also later functioned as a boarding house for the Old Perin’s school. At an earlier time apparently a Quaker Meeting House stood next to it. But in 1985, when the Oxfam book “A Taste of Alresford” was published, this house had been renamed Ferndale House, by the owners Julia and Brian Champion. Brian Champion ran a photographic studio from there: originally the business had been established in Shepperton, but they visited Alresford one day and decided it was the place they wanted to live. They started in a shop in West Street, but later moved down the road to St Joan’s, which at that time was rather derelict. It took two years to rebuild the house how they wanted. Brian Champion was also involved both in international power boat racing, and pheasant shooting, but not at the same time. The article by Len Strong is somewhat before my time as I only joined The Dean School in 1960 ………… however a couple of my most vivid memories were that when we had football (games) lessons we were marched through the streets all the way to Grange Road Recreation ground, which was the only football field in Alresford. And then there was the swimming pool, located in the War Memorial garden, along the riverpath at the bottom of the Dean upstream to where we shared our swimming lessons with the local trout, because the pool was fed by the river through an open pipe. Both swimming and football was taken by our teacher Mr Ginsberg……….. a no nonsense Welshman with a large ginger moustache. In my day, the school caretaker was a large lady, called Mrs Foulkes….. who seemed to spend most of her day carrying buckets of coal around the school to the fires in the classrooms – this was the only form of heating we had there. In the 1930’s, initial education in Alresford was at the primary school, located in the Dean – or on the other hand, if your parents could afford to pay, you went to Miss Curtis’s Alresford Preparatory School in one of the Mews off at the north side of West Street. This was known as A.P.S., or as we boys dubbed it, the “Alf Pound Sausage” school. I started school in the Dean at five years old under the watchful eye of a plump little lady, Miss Wiggins. When she noticed I was left-handed, she said, ‘We can’t have that Lennie, try and use your right hand’ but when I declined she tied my left hand to the chair with a scarf. I guess this would not be allowed today. Anyway, as a result of this treatment, I became ambidextrous. We had mixed classes of boys and girls, although at ‘play-time’ we had separate play areas. We boys had our whips and tops, and played leap-frog and football: the girls had their hop-scotch and skipping ropes. As we progressed through the years, in different classes, under various teachers learning the three ‘R’s (reading, riting and rithmatic), we had periodic examinations – ie those by the visiting ‘nit-nurse’ to see if we had head lice. I finally reached class six, which was taken by the head-master, Mr Jesty. He was a tall Cornish man and used to tell us of his plans to return to the West country when he retired. I don’t know if he made it, but a local road is named after him, in his memory. He was a good teacher and helped us to prepare for our 11-plus exams, with a view to going to college in Winchester. I passed OK but my parents couldn’t afford to send me. So I ‘progressed’ to Perins Senior Council school, which is another story. The Dean school was closed when the new Sun Hill school was built and a development of bungalows is now on the site of the old Dean School, which is now known as ‘Mallard Close’.